3-for-1 deals don’t come up that often, so take advantage while you can! >>>Also, below you will find screenshots and complete details of Jeff’s Quick-Pic Combo Crusher as well! As if just one rule wasn’t easy enough!! Jeff Sillifant’s Quick-Pik Combo Crusher!! 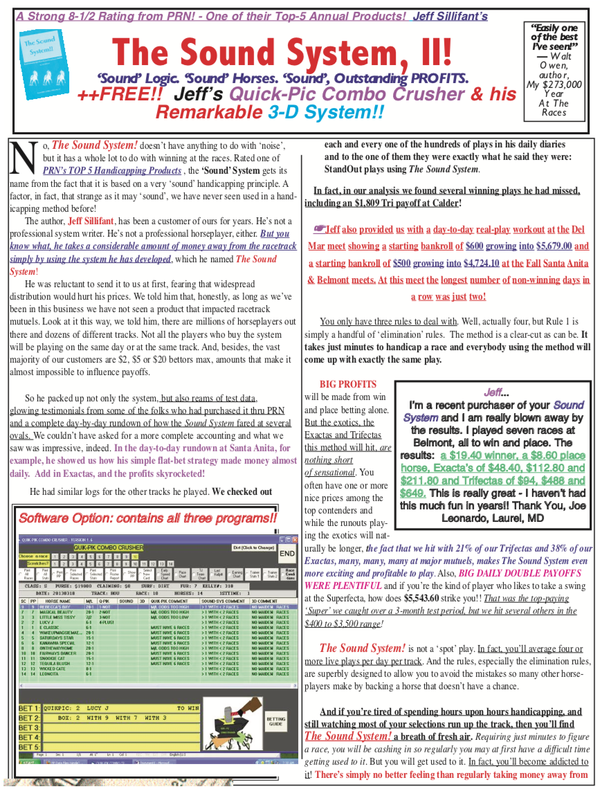 But we just made it a whole lot quicker and easier because now, this incredibly profitable system is NOW on SOFTWARE!! 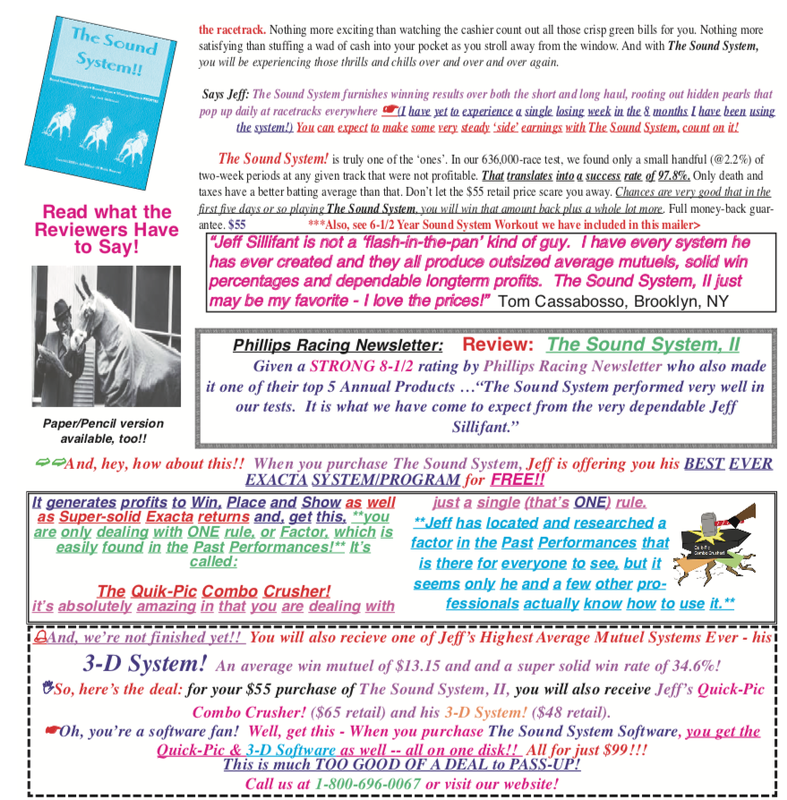 And… we’ve included two of Jeff’s other most popular methods of play: The 3D System, and The Sound System!! Order Early & get a BIG $78 Discount! 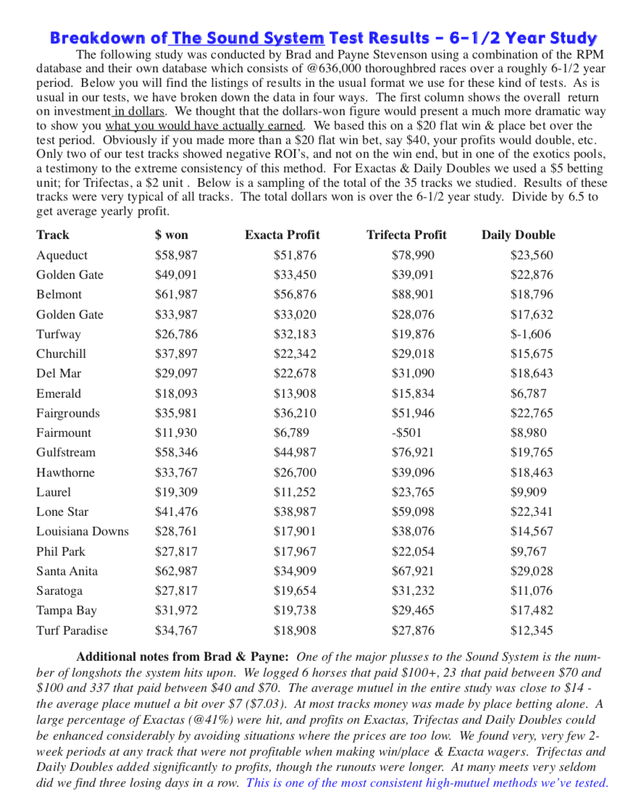 It generates profits to Win, Place and Show as well as solid Exacta returns. Jeff, as many of you know, has produced some of the most profitable, yet easiest to use, methods in the game, like Payday Playday, The Cash Cluster, The Lifeline Discovery, etc. 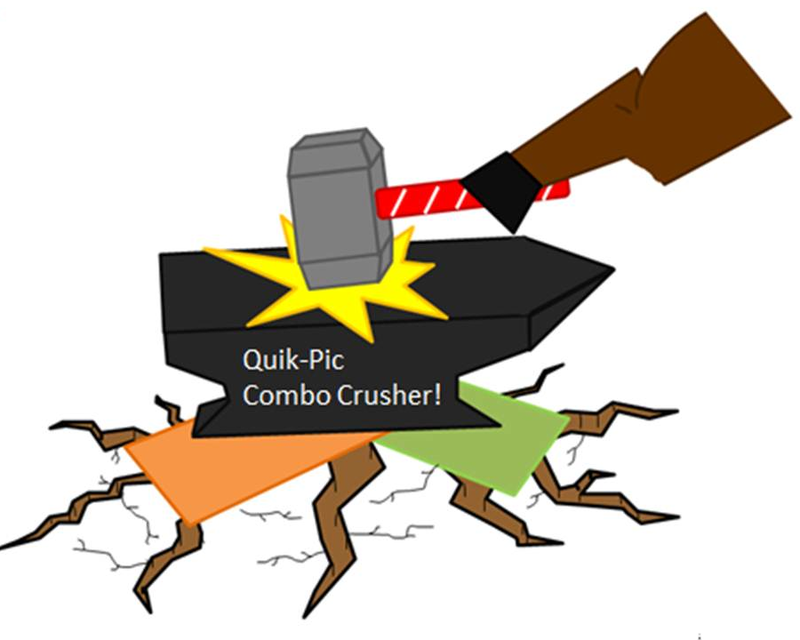 The Quik-Pik Combo Crusher, The Software! 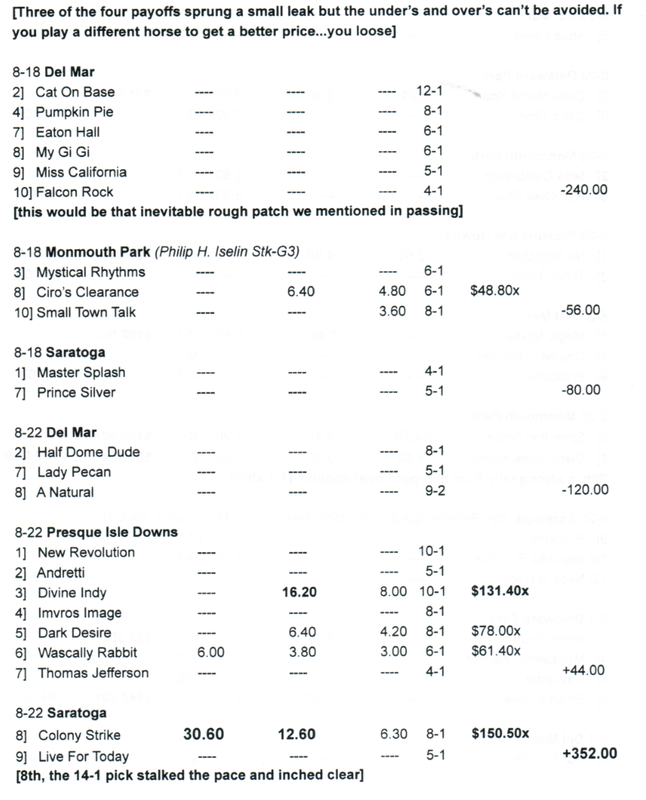 that he actually missed, ranging in price from $7.80 to $23.40 and a couple of the Exactas he missed paid $120+. over $3,800 with 3D and over $9,200 with The Sound System! 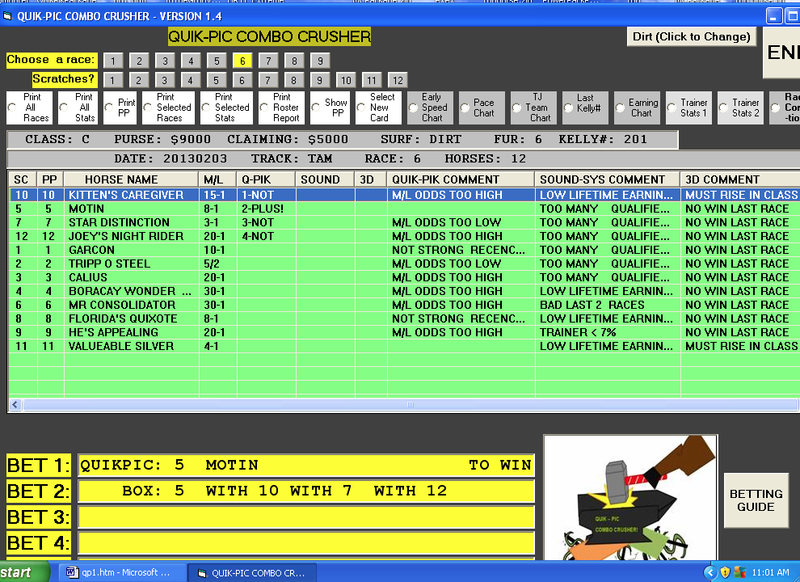 With the QPCC Software, ‘Plus’ horses get overall preference, since they fit the method tightly. A ‘Not’ horse is an ‘almost’ qualifier and is always worth a look at a price. 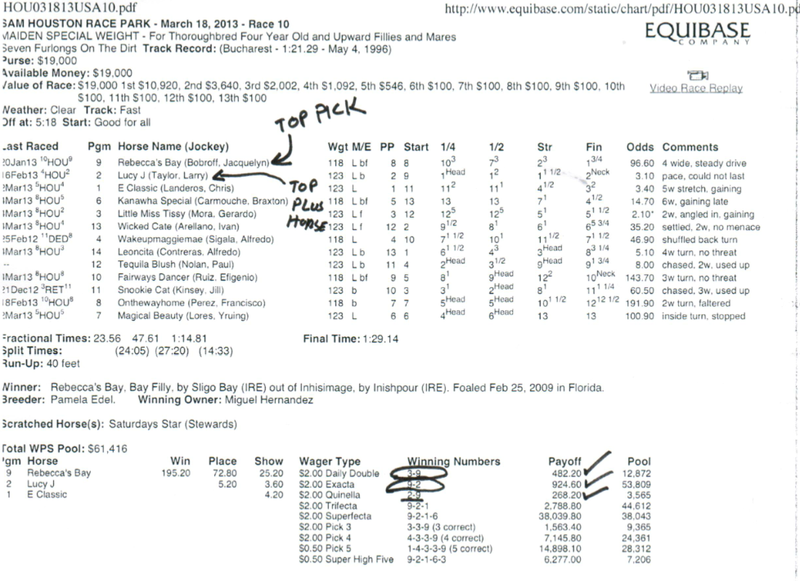 Here, at Sam Houston on 3/18 (10th race), Rebecca’s Baby was the top pick at a huge price — $195.20 to win!! Lucky J, the highest scoring ‘Plus’ horse, ran 2nd. The QPCC Software said ‘Box’ 2-9-7-3. That got you a $924.60 Exacta! 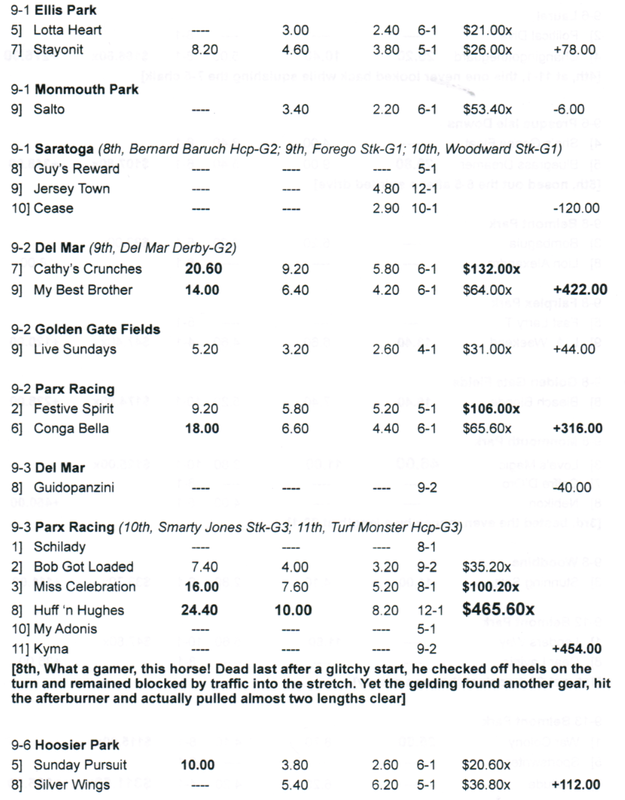 Using the Daily Double ‘criss-cross’ strategy, a $482.20 Double was also cashed (see 9th race below). 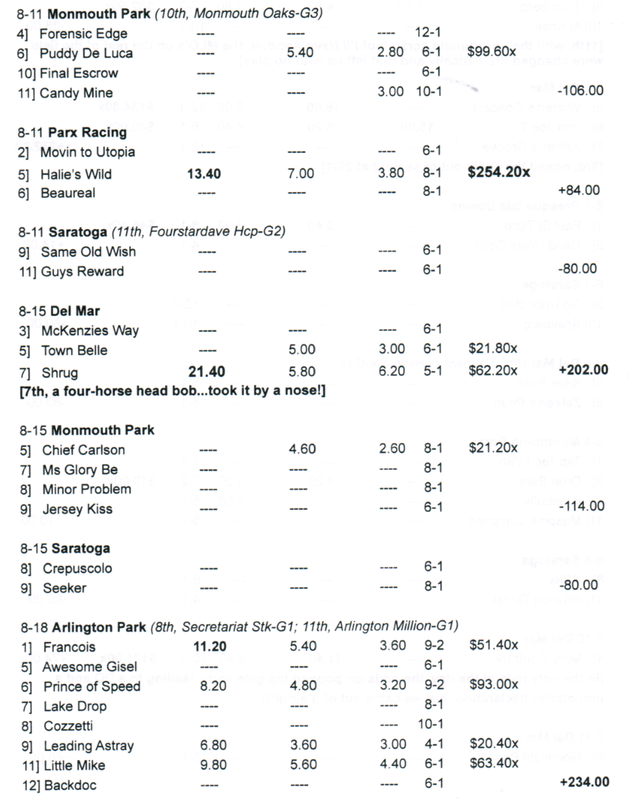 The 9th race at Sam Houston 3/18. 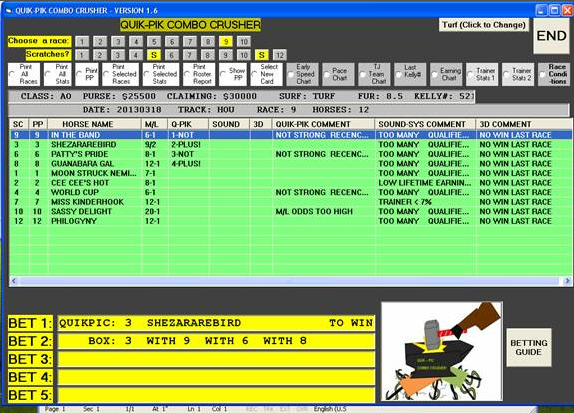 Shezararebird is the chosen play, winning at $11.60. 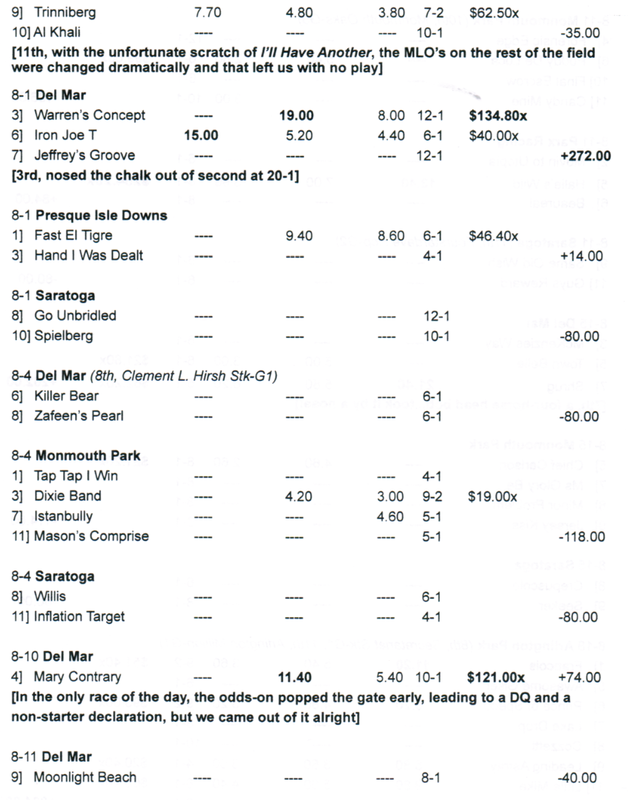 The suggested box 3-9-6-8 resulted in a decent $47.80 Exacta and $211.00 Trifecta. 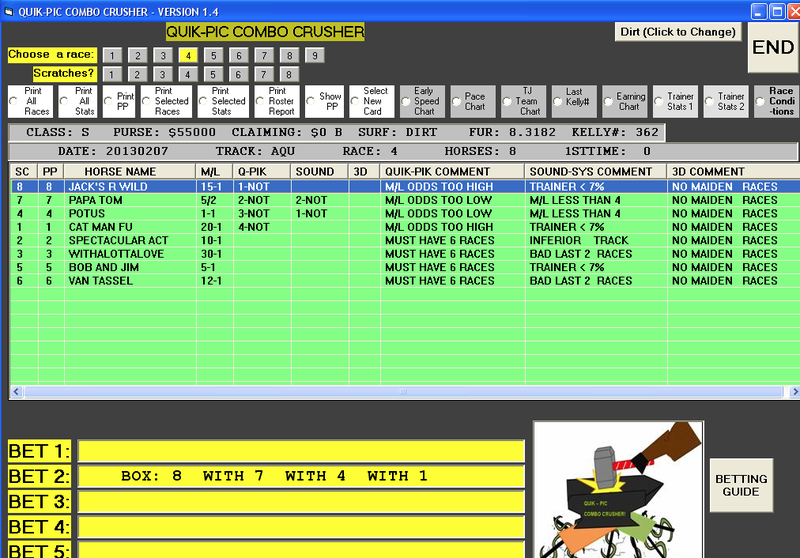 but the software provides the user with an Exacta box of 8-7-4-1 ($24 for a $2 Exacta box). The result: a nice $105 Exacta payoff and, had you invested another $24 in a 4-horse Trifecta box, a $333.50 payoff would have been your reward. 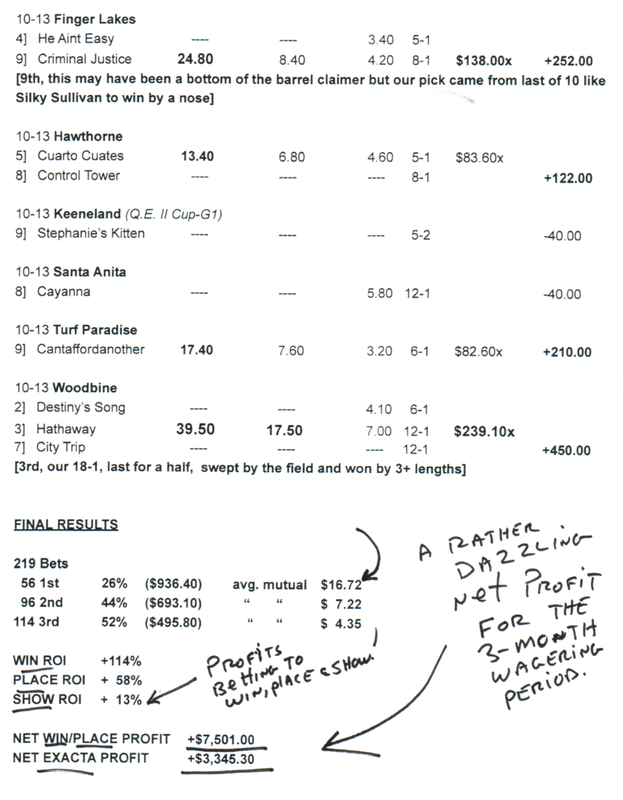 In this example, the suggested win horse, Motin, ran 5th, but the suggested Exacta box — 5-10-7-12 — paid off at a big $242.40 as the top scoring horse, Kitten’s Caregiver, ran 2nd at 40-to-1. 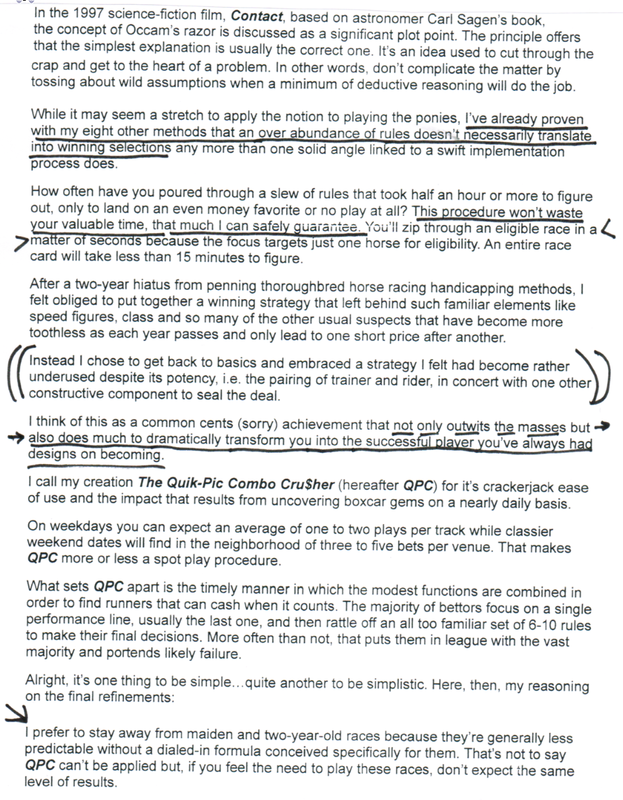 NOTE: the 1-NOT in the Q-PIK column means the horse qualified on every rule but one. Motin fully qualified (thus the ‘PLUS!’ designation), so he was chosen as the play. A PLUS! horse will always earn precedence over a NOT horse, but as you can see with Kitten’s Caregiver, top-scoring horses are always worth a look, especially in your exotic wagers. he paid a hefty $24.80 for the win. 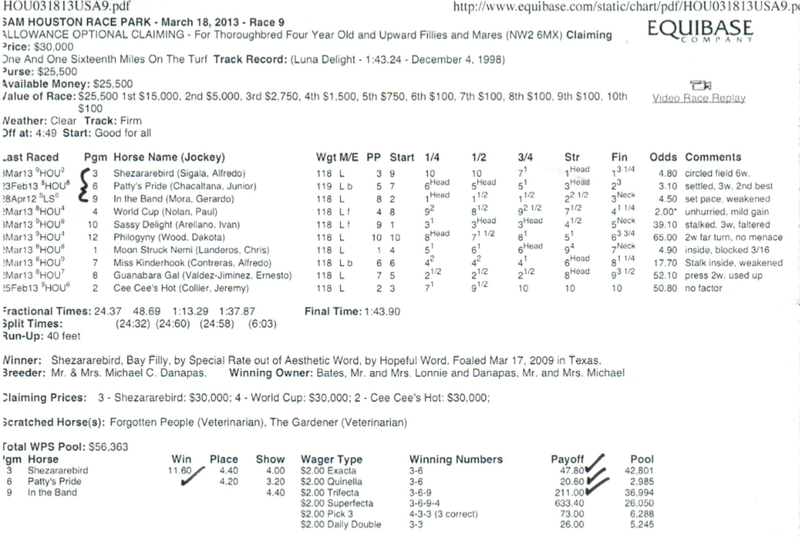 QPCC missed on this Exacta box, but with boxcar winner, no big deal. One of the great features of QPCC is that it hits with great prices and the Exacta option, especially when at least two of the horses in the suggested wager are at 4/1 or higher morning line, has proven extremely viable as well. 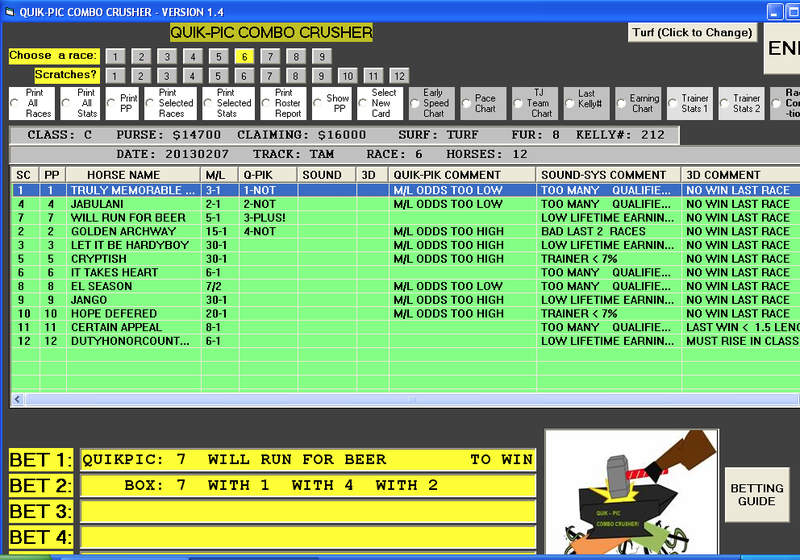 Final Workout/Wagering Data Page Below — Again, you will receive the entire workout when you purchase the system! 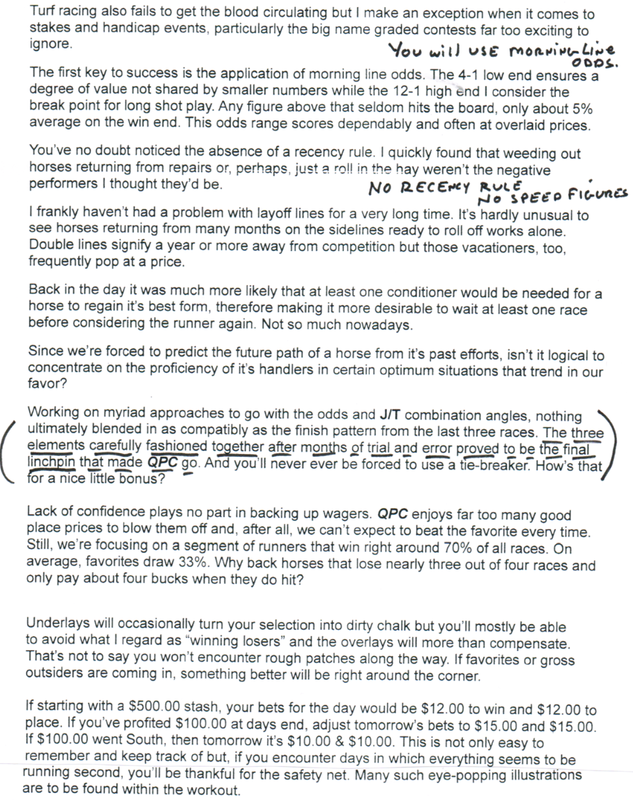 Again, we researched and verified all of Jeff’s plays, and then tested the system using our own database (607,000 races). Based on our research we can guarantee that you will experience results similar to Jeff’s. 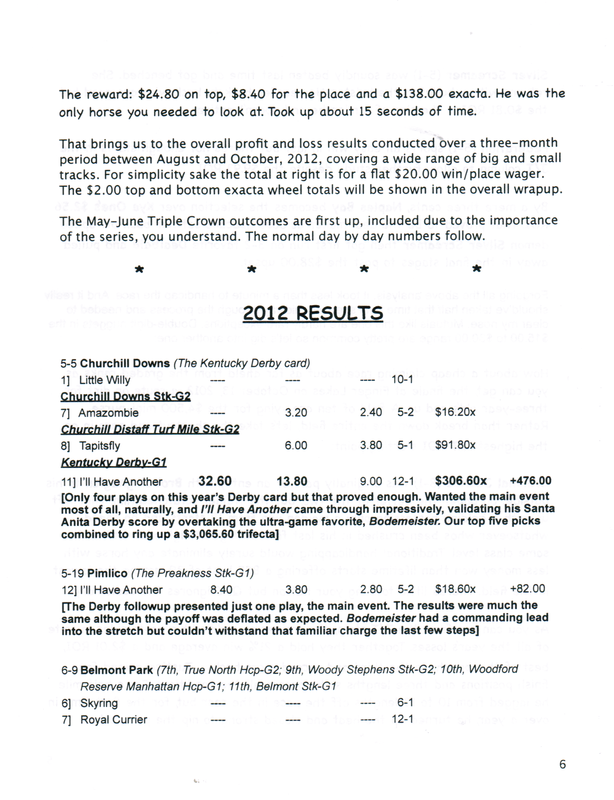 Jeff makes $20 win/place wagers and wheels his main play in the Exacta. But even if you only bet $5 to win/place and $1 Exacta wheels, you will still enjoy substantial profits. 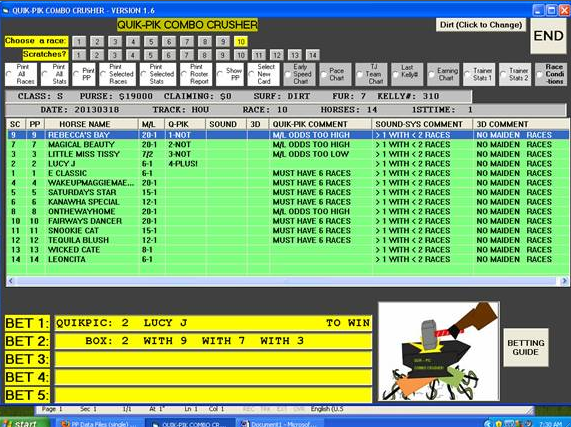 The Quik-Pik Combo Crusher works folks — we have proven it over and over again in our main database study as well as in our random 90-day wagering period studies. You get all three programs — all are displayed on the main screen — for just one low price. 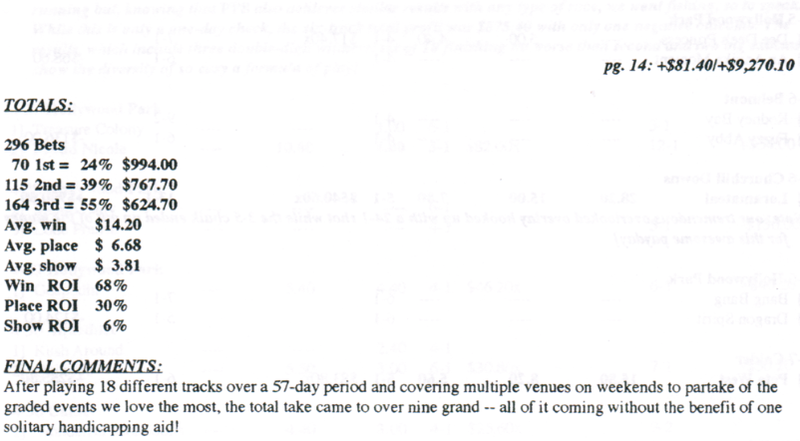 The Sound System showed profits to win/place/show and with Exactas. 3D is nicely profitable on the win end (place & show are break-even propositions) & for Exacta play. The software will retail for $177, but if you act quickly, you will receive a big $78 discount, so your price is just $99. QPCC is affordable to most and you can call us and put the method on our 3-pay/no interest plan if you wish (1-800-696-0067). And, if you don’t like QPCC, for any reason, simply return it for a full refund. And please call if you have any questions.